First things first, Happy International Women's day! I plan on writing about this a little later on in the week, so please hang fire for some serious girl supporting girl inspiration! 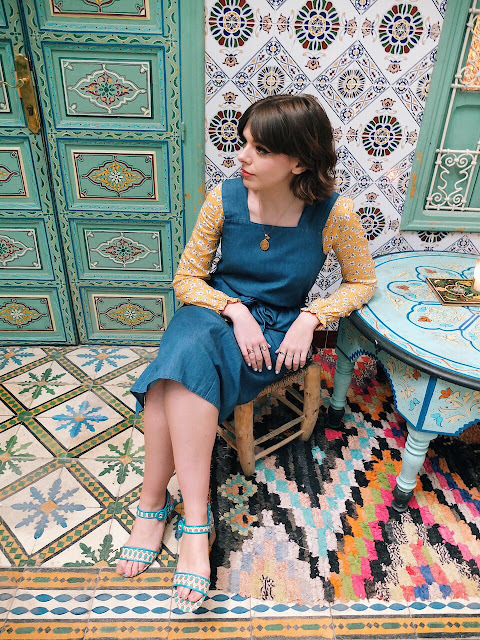 I feel like I've got so much too talk about over the next few weeks so I'm having to prioritise and as it's been over a week since I returned from Marrakech I think it's time to discuss my trip... And hopefully encourage you to go... So then I've got someone to talk about it with, instead of continually boring everyone around me (cashier at my Sainsbury's Local included)! I'm talking about this trip in a two part blog extravaganza (maybe that word gives it a touch more credit then it actually deserves but we'll stick with that for dramatisation sake), the reason being is that I want to show you just how amazing it is culturally and scenically but separately away from that, I want to talk to you about what I wore! Normally I feel like where ever I toddle off to I dress accordingly for said destination but still very much in my style and realistically, not too dissimilar to how I'd most likely dress at home... FYI you can wear dungarees internationally, it's cool they're not illegal in other continents, let's all thank our lucky stars about that. 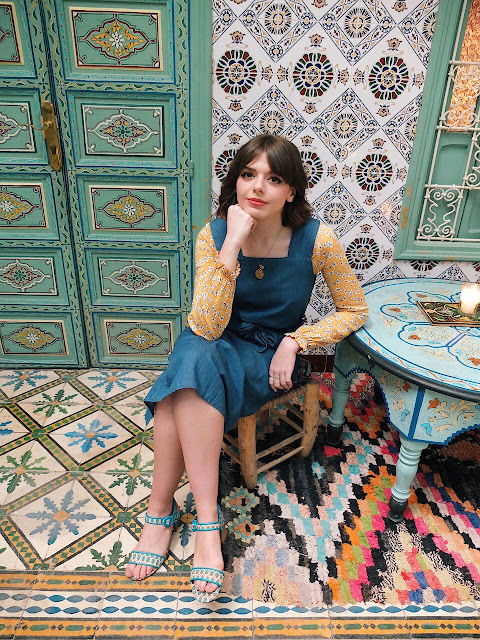 But Marrakech was so very very different and what better way to explain then through one of my favourite outfits from the entire trip, see photos below and above. Why am I talking like I'm doing this in a seminar, on a PowerPoint presentation? The thing with Marrakech is as a lovey lady it's always nice to respect the culture and although covering your legs to your knees and your shoulders isn't imperative modern day practise, it is only polite. Especially when staying in the Old Town/Madina where culture is a heck of a lot more traditional. This is one of the first challenges you face when packing for Marrakech along with the common question of, "how can I cover up in 25-30 degree heat and still look as cool as a cup of Moroccan mint tea?"... Well my answer to you starts and ends with Midi's, lots of them. I feel like I kind of went back to basics, long pinafores in a light denim, pleated midi's, vintage loose cut blouse and chiffon jumpsuits. Simple shapes, minimum layers. I decided the best way to feel more "summery" and less "frumpy" was to finally inject a little bit of colour in to my life, it's a big step I know but it's always life affirming to face your fears and I'm so pleased I did. You see as well as being allergic to colour as a rule, I'm also a life longer believer in the rule, coordination is key and by some sort of happy- beautiful- accident I managed to so perfectly colour coordinate with the city and I couldn't have been more smug with myself for doing so. The outfit accompanying this post fit in with the Riad I stayed at like it was just part of the furnishings. Turquoise, yellow and blue... who knew, these were the 3 main colours for pure outfit satisfaction? Funny thing is I never would even dream of wearing yellow back home, it's way out of my colourphob comfort zone but this outfit in particular got such a great reaction from you guys on Instagram, that it would have been rude not to talk about it. 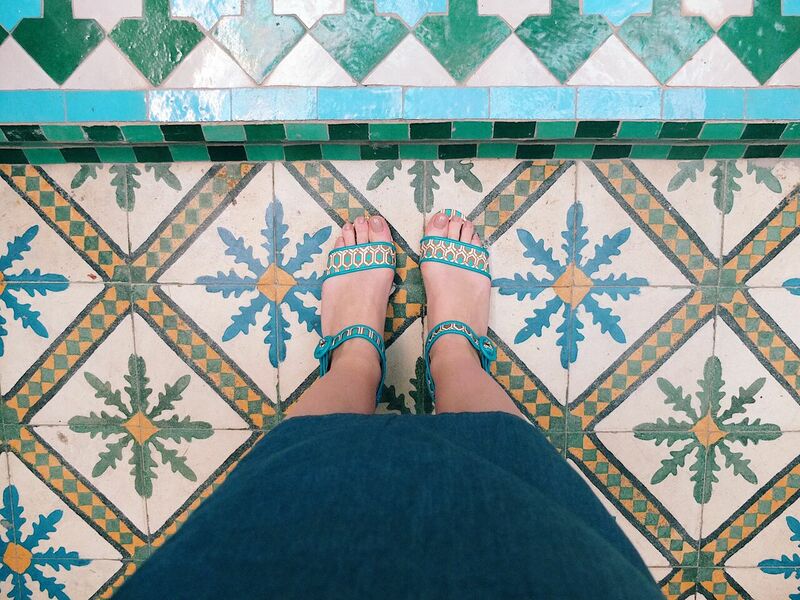 Now let's discuss the sandals, it was like they were purely designed to be worn on Moroccan tiles! They are by the super talented folk at Ravel as part of a limited edition collection, collaborating with masters of pattern at the V&A museum. 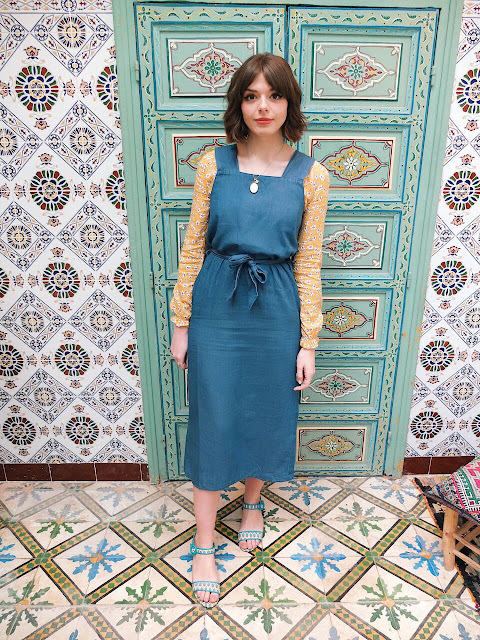 Although the pattern of the sandals is a bit more on the retro seventies side, I loved softening them up with a floaty A-line Midi pinafore and yellow floral blouse underneath. As an added bonus they are THE comfiest sandals, I walked round all day in these little beauties without a care in the world! I couldn't have asked for a more perfect way to kick start my spring/summer wardrobe... whilst also making me reconsider the amount of colour I DON'T wear. I was in a city where colour rules don't exist (even if I did accidentally coordinate- you can take the girl out of England but you can't take the England out of the girl), blues are mixed with yellow, bright pinks and mixed with dark greens and teals are mixed with peaches like something. Wes Anderson eat your perfectly symmetrical heart out. Honestly, it's everywhere! 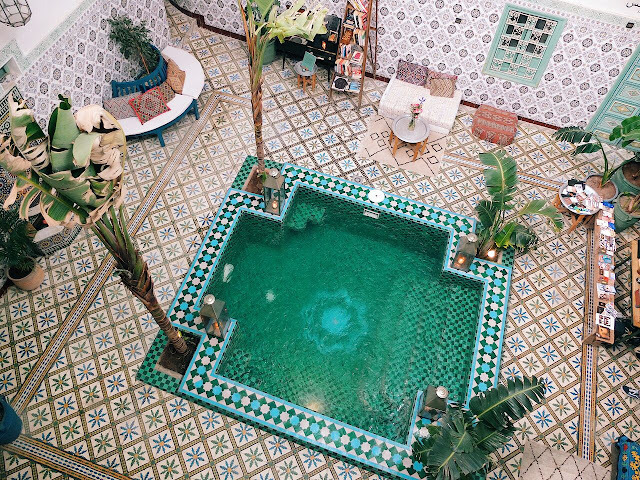 Beautiful patterned tiles, rainbow rugs and mix and match pottery. It makes you realise how much us Brits live in black and white. Basically if there was every a better time for me to embrace colour, I'd like to know about it. And maybe that's just it, maybe the only reason I'm so scared of wearing a little colour every now and then is simply because I live in a place which is equally suppressed from a little vibrancy! 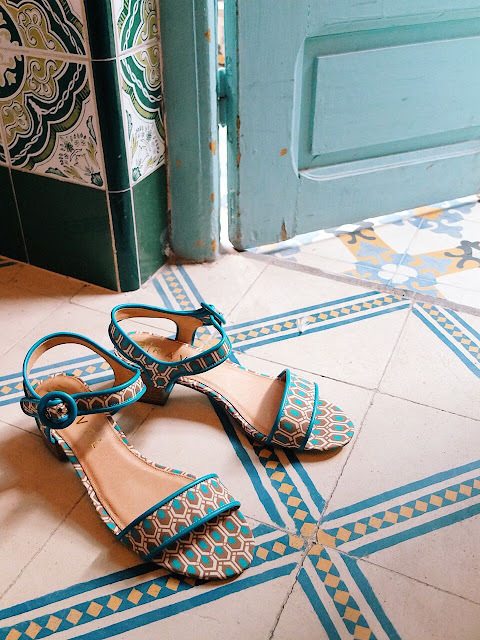 Maybe we always stick to what we know and Marrakech was exactly the city I needed to shake me out of my colour coma...Coloma? Comour?... Whatever! 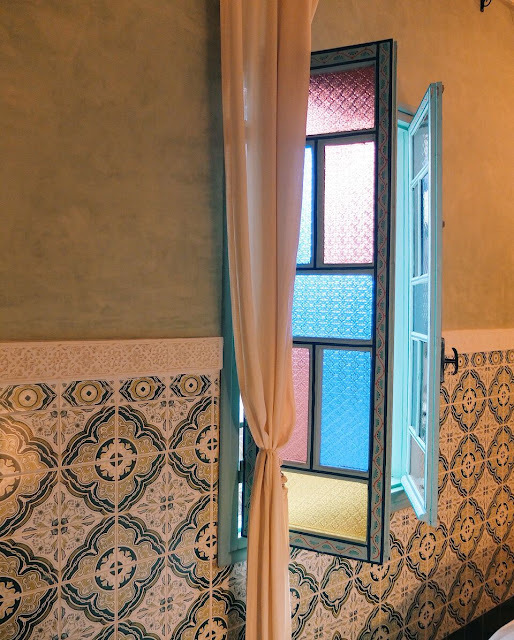 Big thank you to the wonderful folk at Riad Be for making our stay as magical as possible and for letting my photograph every inch of your beautiful building! I'll be back!